Democratic Sen. Robert Menendez (N.J.) is facing 12 counts of corruption charges that include bribery allegations. Prosecutors said Menendez accepted bribes from Dr. Salomon Melgen, a previous donor to the New Jersey senator's campaign. Menendez, who took flights on Melgen's private jet to the Dominican Republic, lobbied in favor of Melgen to settle a multi-million dollar billing dispute with the government. "The defendants’ bribery scheme began shortly after Menendez’s elevation to the Senate in 2006, when Melgen began a pattern of treating Menendez to weekend and weeklong getaways in the Dominican Republic that would continue for the next several years," prosecutors said in a filing. "For the first four years of the corruption scheme, the all-expense paid trips Melgen provided often included free roundtrip flights on Melgen’s private jet for Menendez and his various guests. When the doctor’s private jet was unavailable, Melgen supplied equally luxurious travel for the Senator." 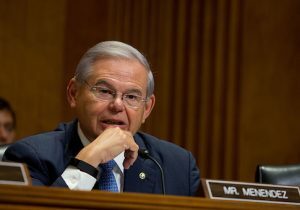 A number of top Democratic senators have accepted campaign cash from Menendez this year. Menendez contributed tens of thousands to his Democratic colleagues from the New Millennium PAC, the senator's political action committee. Sen. Tim Kaine (D., Va.), Hillary Clinton's former running mate, accepted $10,000 in contributions from the New Millennium PAC in late February of this year. Sen. Elizabeth Warren (D., Mass.) took a $5,000 contribution from Menendez's PAC in early March. Sen. Debbie Stabenow's (D., Mich.) campaign took $10,000 from Menendez's PAC in late March while Sen. Jon Tester's (D., Mont.) campaign also accepted $10,000 around this time. Sen. Kirsten Gillibrand's (D., NY) campaign also took $10,000 in contributions from Menendez's PAC on March 23. Sen. Chris Murphy's (D., Conn.) campaign received a $5,000 donation from the New Millennium PAC in late June. "Instead of distancing themselves from Bob Menendez after his indictment on bribery charges, his Democrat colleagues have stood behind him, even accepting tainted campaign cash from the disgraced Senator," Bob Salera, the deputy communications director for the National Republican Senatorial Committee (NRSC), told the Washington Free Beacon. "If Senate Democrats don’t return Menendez’s donations, voters should take their inaction as a tacit endorsement of his corruption." The Democratic senator's trial began on Wednesday when the judge told Menendez's lawyer to "shut up for a moment" after proceedings went underway. The lead up to the trial garnered very little media attention, the Federalist reported. "I look forward to proving our innocence and being exonerated," Menendez told reporters last week. None of the Democratic senators returned requests for comment.